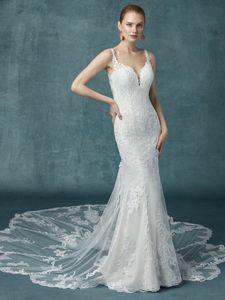 Description: Soft lace cascades over tulle in this chic fit-and-flare, drifting into a breathtaking illusion extended train with petal-shaped hemline. Sheer straps glide from illusion plunging sweetheart neckline to illusion scoop back. Finished with covered buttons over zipper closure.